The popular festivals in Colombia contain a wealth of culture and are full of rhythm, happiness, and color. The country hosts a long list of fairs and festivals and these are celebrated throughout the year and throughout all the municipalities of the country. Some of the festivals in Colombia have a tradition that stretches back over a hundred years, which makes them popular tourist attractions. 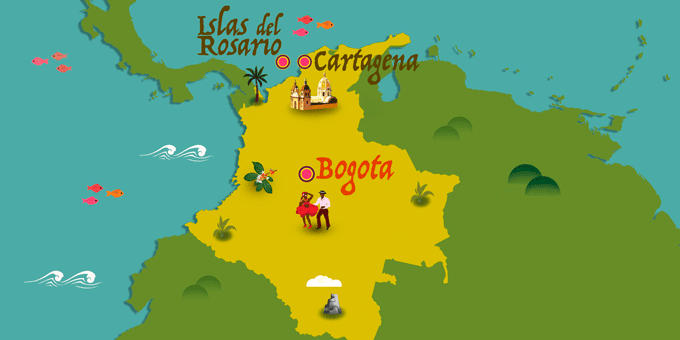 So that you can enjoy the authentic feel of the country, we recommend the following events in Colombia. The Manizales Fair welcomes in the New Year and is celebrated between the 5th and the 11th of January. There are all kinds of activities, both traditional as well as mixtures of old and new, from bullfights to all the different parades. The Black and White Carnival is one of the most popular festivals in Colombia and is one of the most important festivals in the whole country. It dates back to 1607 when the black slaves from Antioch rebelled against the authorities. This incredible festival takes place between the 2nd and the 7th of January each year, and it has been declared a UNESCO World Heritage Site. 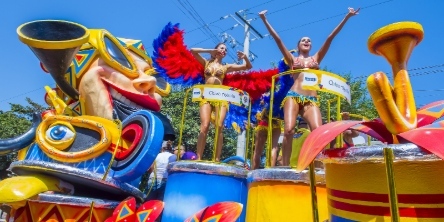 One of the main events in Colombia is the Barranquilla Carnival, which is the second largest carnival in the world and only surpassed by the carnivals in Brazil. Each year, it begins on the Saturday before Ash Wednesday. For 2019, this will be from the 2nd to the 5th of March, when Colombians and millions of visitors come out onto the streets to experience the joy of the festivities. The event is so important that it has been declared both a National Heritage and a Masterpiece of the Oral Heritage of Humanity. Of all the events that take place in Colombia, the International Festival of the Vallenata Legend, or more succinctly, the Vallenata Festival, is the star attraction. This festival is celebrated between the 27th and the 30th of April in Valledupar, the capital of Vallenato. Apart from dancing, they revive all types of artistic expressions related to the Vallenato, including, peasant poetry, story-telling. Oral traditions and socio-cultural expression also form part of the celebrations. One of the outstanding Colombian festivities is the Mono Núñez Festival of Andean Music. This festival is celebrated during the month of May in Ginebra, a municipality in the Cauca valley. The first festival took place in 1975 in honor of the Maestro Benigno Mono Núñez. Its importance lies in it being an artistic platform for Andean music at an international level. In addition to many other events in Colombia, the Medellin Flower Fair takes place during the month of August. This festival was initially celebrated in May, but in 1958 it began to be celebrated in August so that it coincided with the month of the Antioch independence. There is also the World Festival of Salsa in Cali, the National Cumbia Festival in Magdalena, and the Harvest Festivities in Pereira, to name a few more. The Latin American Festival of Folk Dance from the Valle del Cauca takes place each year in October. Its objective is to reconstruct the Latin American history, memory, and cultural identity. During the celebrations, there are dance workshops, craft fairs, exhibitions, gastronomic festivals, academic events, and music sessions. Other festivals that take place during this month are the Festival of the Green Moon in San Andrés Islas, the Drum Festival in Bolívar and the International Film Festival in Bogotá. In November the Independence Fair is celebrated in Bolívar, where the National Beauty Pageant of Colombia is held. During the festival, the contestants parade in whaleboats, in swimming costumes, evening dress and there is the Popular Crowning of the Beauty Queen. Another important festival celebrated in November is the Gold Pirarucú, the Festival of Popular Amazonian Music, which is the most famous in the country. The Cali Fair is, without doubt, the event which draws the most visitors and tourists to this region. The fair has taken place since 1957, between the 25th and the 30th of December. Among the most sought after events are the Bullfighting, the Crowning of the Beauty Queen from the Comunas (the municipalities of Cali), the Streets of the Fair and a large concert. The events list is unsurpassable: opening parade with the Salsa schools, a procession, a parade of the Old Cali Carnival, and a Mega-concert. In addition, you should not miss out on a visit to the Tascas de la Feria de Cali (the Cali bars)where you can taste a wide variety of local dishes. Whenever you travel to Colombia you will always find something to celebrate, which is why they say that Colombians flow. The popular festivals of Colombia are more than music and entertainment. They have all the zest of the country within them.